Acharya Nagarjuna University Guntur invites applications for the admissios into Post Graduation Courses offered on its Campus,PG Centre,Ongole and its affiliated colleges for the academic year 2017-18 through ANUPGCET 2017 .Details of courses offered ,eligibility conditions etc.are available in the information brouchure.The information brochure and online application are available on the website www.anudoa.in/ www.anu.ac.in. The application form can be filled online after going through the instructions therein. NOTE: Candidates who are appeared and qualified in ANUPGCET-2017, They alone are eligible for Fee Reimbursement provided, they fulfill all other conditions of Govt. of AP Rules for Reimbursement. • CANDIDATES WHO HAVE COMPLETED THEIR QUALIFYING EXAMINAITON OR APPEARED FOR THE FINAL YEAR EXAMINATION IN MARCH / APRIL 2017 ARE ELIGIBLE TO APPEAR FOR THE ENTRANCE TEST. • Candidates who wish to take Admission into the P.G. Courses offered by Minority Colleges are also required to appear for the Entrance Test(s) conducted by the University. • There is no provision for Revaluation, Retotaling or Personal verification of scripts of Entrance Tests. • All candidates who apply for entrance test satisfying the eligibility criteria will only be allowed for the Entrance test. • Any candidate allowed for entrance test, later found to be ineligible will not be issued Rank card. Even rank cards are issued in such cases, it will be cancelled later and such cases will not be entertained for Counseling. • Mere allowing a candidate for the Entrance Test will not have any claim or right for admission into P.G. Courses. They have to satisfy the Eligibility Criteria given in Table-II. The decision of Admitting Authority is final in all such matters. • Selected candidates (who were given Ranks) should bring all the Original Certificates along with one set of attested Photostat copies of certificates listed in Note – 2 to the Counseling. He / She has to submit them and copies of certificates submitted will not be returned. If the original certificates are not produced for verification at the time of counseling, the candidate has to forfeit his / her seats. • Candidates admitted to Entrance test and subsequently getting admission by furnishing false / incorrect information / indulging into any other kinds of fraudulent methods are liable for prosecution and cancellation of their admission without notice. • Hall Ticket and Rank Cards are should be retained by the Candidate even after the Entrance Test as it is required at the time of Counseling. • There is no age restriction for Admission into any P.G. courses. However, those candidates who crossed the age of 30 years for OC, 34 years for BC, SC and ST are not eligible for claiming / applying any Fee Reimbursement (As per Memo No.10537/SW. Edn.2/2011, dated: 01-11-2011). / subject in A.N.U. Colleges including A.N.U. P.G. Centre, Ongole. However, a P.G. Degree holder who wishes to pursue another P.G. Course in a different discipline may be given admission but is not eligible for Hostel Admission, any Scholarship / Exemption of any fees applying for reimbursement etc. • No Candidate is entitled to pursue more than one Full Time course at a time. If admitted, no candidate can undertake any other Full-Time Assignment / Employment / Study of any other Full-Time Course simultaneously. 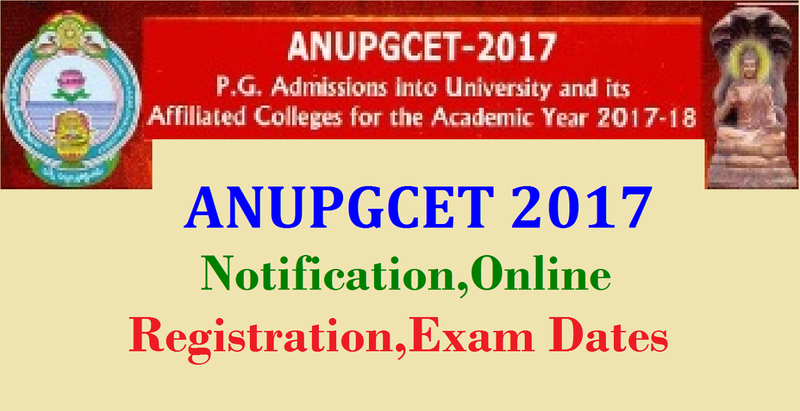 (b) ANUPGCET – 2017 Information Brochure. 4. Click on the link appearing as Click here to register for ANUPGCET – 2017 Online Application. 9. Then proceed to fill the Name and other personal details with present address and date of birth. Please fill the details as per SSC or equivalent certificate. 11. After completion of registration details entry, your Mobile will receive SMS of a Security Code, please type the Security Code in the box provided in the Registration Form and immediately your screen will display a message as “VERIFIED” in green color. 12. Then click “Register & Proceed” button for filling the application with all academic and other details along with scanned Passport Photo and Scanned Signature (signed on white paper only). Fee Payment Process : Click on Online Payment button. Now click on Online Payment through SBI Collect button. Read the instructions and click checkbox to proceed payment and click the proceed button. 14. Mow your mobile will receive a message “Your ANUPGCET – 2017 application is submitted successfully with Application No : XXXXX with Payment Ref.Id : XXXXXXXX”. 18. You can get a printed copy of application at any time using your Application No as ID and Date of Birth as Password using “Print Application” option.